Welcome to our newest citizens! On September 7th, 35 folks from 15 different countries took the Oath of Allegiance at Mammoth Hot Springs in Yellowstone. 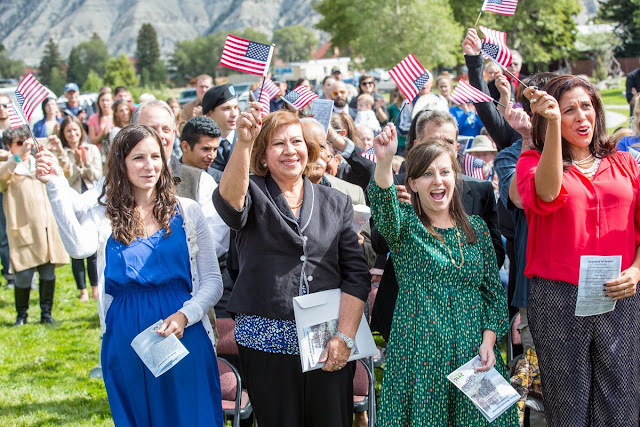 The naturalization ceremony was held at 11 a.m on the lawn adjacent to Opal Terrace, across the road from Liberty Cap. How cool is that? The immigrants are originally from Burma, Canada, People’s Republic of China, Columbia, El Salvador, Mexico, Peru, Philippines, Spain, South Africa, Tonga, Turkey, Ukraine, United Kingdom, and Yugoslavia.